Mint state and key date listed Jefferson Nickel values is for graded, certified and authenticated coins in PCGS or NGC holders. The rest are a sample of raw coin sell but this is not a guarantee your coin with the same date, mint, grade and holder will sell for this exact value. Also examples struck with Full Steps (FS) will be worth a premium above a coin in the same grade. The 1950-D is the lowest mintage, business strike, key date of the entire series and it’s really not that rare and valuable with a mintage of 2,630,030 and a starting value of $20 in MS64 FS (Full Steps). If you want more valuable Jefferson Nickels then you must look into the varieties for this series. In AU (About Uncirculated) you can get a couple dollars out of Jefferson Nickels dated 1938 through 1945 and this includes the silver War Time examples from 1942 through 1945. The silver nickels are known for their large mint mark over-top the Monticello and our the only Jefferson Nickels with large mint marks in that area. Otherwise most Jefferson Nickels are worth face value in grades less than AU. Proof, SP (Special Proof) and Matte Finish coins are worth a decent premium and 1994 and 1997 Matte Proofs are worth a good premium, and so is the 1966 SMS since they start at $25 and up. The 1964 SMS is extremely rare and worth at least $1,000, plus proofs from 1938 through 1955 are worth a decent premium compared to proofs after 1955. It’s thought by most experts that proof Jefferson Nickels dated 1955 and earlier are one of the best investments because they’re still affordable but the mintages are low. Grade is important and so is the coin having full steps but you will have to find coins that grade MS66 FS before they’re worth a decent premium. However there’s a few exceptions like 1953-S that’s more valuable in lower grades and in MS63FS is worth at least $300, but most Jefferson Nickels are not worth much in that grade. If you’re looking for value in Jefferson Nickels then varieties is where you look. Here’s a list of the most popular and notable varieties plus their starting value in AU (About Uncirculated): 1939 Doubled Die Reverse starts at $200, 1942-D Over Horizontal D starts at $175, 1943-P Doubled Die Obverse (DDO) starts at $50, 1942/3-P starts at $100, 1945-D Doubled Die Reverse (DDR) starts at $50, 1949-D/S starts at $50, 2005-D Speared Bison starts at $210 in MS63, 1971 No S proof Set starts at $800 in PR63. 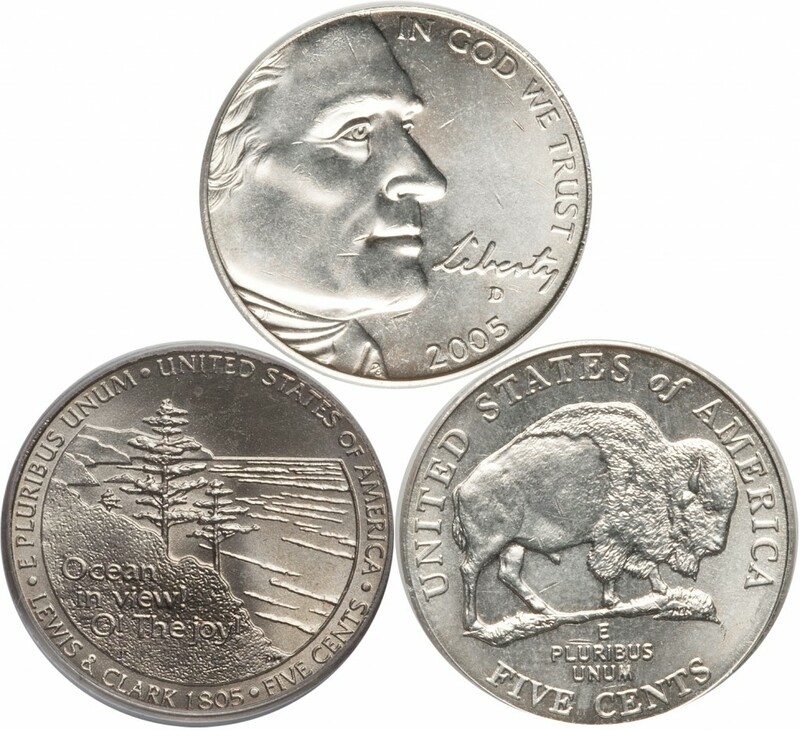 2005 Ocean View and Bison (Buffalo) Jefferson Nickel design. Mint mark: To the right of the building on the reverse None (for Philadelphia), S (San Francisco), D (Denver). No mint mark for 1965, 1966 and 1967 and in 1968 the mint mark was moved to the obverse and under the date. Mint mark: “P” (for Philadelphia), S (San Francisco), D (Denver) above the building on the reverse for War Time Nickels only. 2005-P Ocean In View Rev. 2005-D Ocean In View Rev. 2005-S Ocean In View Rev. Jefferson Nickel value by date, mint, grade, design type and variety.